A regional lawyers group has both condemned and urged a stop to the Zimbabwean authorities' vicious crackdown on alleged instigators and perpetrators of last week's deadly anti-government protests that have claimed 12 lives, according to independent estimates. In a Monday statement, the Southern African Development Community Lawyers Association (SADC-LA) said it was saddened by the sorry turn of events in Zimbabwe. 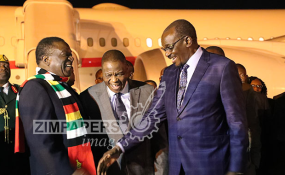 "The challenges in Zimbabwe are deep-seated and require an intense, courageous and fearless national dialogue by Zimbabweans," said the group. "In the wake of recent but most unexpected and wholly unfathomable repeat of the August 1 2018 events in Zimbabwe, SADC-LA is saddened at the state of affairs in Zimbabwe and the region. "We condemn in the strongest terms all forms of violence and urge government of Zimbabwe to assume principal responsibility for halting the cycle of violence, killings and initiate inclusive national dialogue process." The violent national skirmishes that rocked, most intensely, Harare and Bulawayo, between Monday and Wednesday last week, coincided with a Zimbabwe Congress of Trade Unions (ZCTU) call for a job stay-away to protest a government move to more than double the pump price of fuel in the country. The protests left a trail of destruction as overzealous mobs barricaded roads and stoned passing motorists while some shops were looted in the process. Armed forces deployed to quell the protests responded with the firing of live ammunition at protestors with local NGOs claiming a dozen people died in the process while nearly 70 were said to have been treated for various degrees of gunshot wounds. In its statement, the lawyers' group castigated the Emmerson Mnangagwa led administration's failure to respect the Zimbabwean constitution which guarantees freedom of assembly and peaceful protest against genuine grievances. "It is government's sole responsibility, with all the material in its possession, to facilitate peaceful demonstrations and to lead thereafter, in the process of engaging in an open and meaningful conflict resolution process without resorting to any form of violence. "We are saddened to note that once again government seems to have failed in this regard, especially when we consider previous skirmishes that took place on the first of August and the lessons that are supposed to have been learnt. "The use of excessive force, lethal weapons and the deployment of the army in these circumstances clearly demonstrate this failure," the regional lawyers said. President Mnangagwa has defended the heavy handed action by the State saying no government would sit idle while citizens destroyed property at will.